Consumers will spend about $2.6 billion in Halloween candy this fall says a recent National Retail Federation survey – but $2.6 billion in Halloween candy will not be eaten. Close to 70 percent of parents, according to The National Confectioners Association, confess to confiscating some of their kids’ Halloween haul. The fear with that approach, however, is that it could prompt children to start gorging or hiding candy because they know their coveted prize will soon disappear, or create a scary start to a lifetime of bad eating habits. Yet, there are better alternatives to establish a win all around. 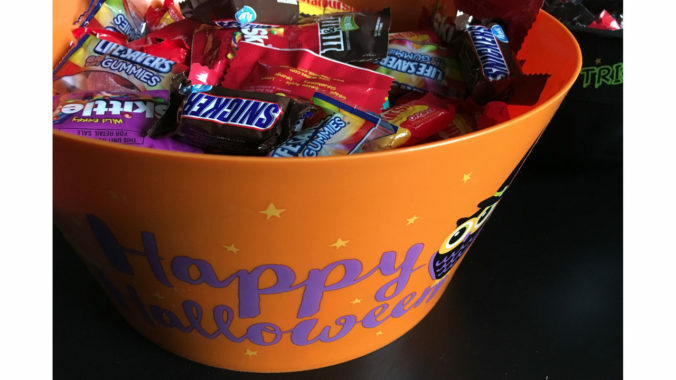 SET UP A CANDY CONTAINER All the candy from Halloween (and from birthday parties or anywhere else) goes into one place and then parameters are set up within your household as to how much and how often candy can be enjoyed – creating habits. This candy is mixed into your already-established sweet routine – cookies, cupcakes, ice cream. The Halloween candy is not an additional supplement. HAVE A MEAL FIRST Teach children to save room for their Halloween haul by giving them a small meal before trick-or-treating. Then, remind them to pay attention to their tummies. OFFER A TRADE Allow your children to trade their candy for something else, within reason, such as a trip to the toy store. TURN THE CANDY INTO A SENSORY GAME Turn the introduction of unfamiliar sweets into an opportunity for sensory exploration – the best method for overcoming picky eating and laying a foundation of healthy eating habits for a lifetime. Allow children to explore their variety of candy loot, with all of their senses – smell it, feel it, hear it, touch it and even look at it – NOT just taste it. Do this together with children as a fun activity. LIMIT THE COLLECTION Want to limit how much candy your kids eat? Then limit the amount of candy your children can collect. Reduce the number of houses your kids can hit up, or make sure their Halloween bag is somewhat smaller than a suitcase. Also, focus part of the Halloween experience on the costumes and decorations – it’s NOT all about the sugar. DON’T FOCUS ON NUTRITION The suggestion to use Halloween to talk about nutrition is misguided. Telling your child simply their Halloween candy is unhealthy will not stop them from wanting to try it, sometimes crave it and start eating broccoli instead. FOCUS ON HABITS – Sweets and treats are part of life, but we have to put them into our diets in the right ratios. Set limits and parameters as to how much candy and how frequently it can be consumed. The timing doesn’t really matter; let your child decide when to eat the treat. However, once he/she has had the amount of daily treat you’ve established, then it’s done for the day. This allows children to better understand proper proportion. If they eat a candy bar at 10AM, that’s fine, but that’s it for the day OR they may choose to eat a candy bar after dinner, but that’s it. WE ALL MAKE MISTAKES – There will be days when your child will have a treat in the morning and then be invited to an ice cream outing in the afternoon. Sometimes you’ll break the rules, because it’s all a learning process. Full Sail University Is Building The Largest On-Campus Collegiate Esports Arena in the U.S.